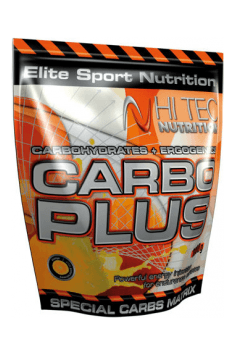 CARBO PLUS is a modern carbohydrate enriched with HCA, taurine, ribose, glucuronolactone , and a full set of B vitamins and antioxidant vitamins C and E.
Maltodextrin, in CARBO PLUS are glucose polymers having an average chain length, which provide in a short time a lot of energy to working muscles and facilitate rapid re-synthesis of muscle glycogen supercompensation phase after training. CARBO PLUS, in addition to maltodextrins, contains powerful ergogenic substances that aggravate the body's adaptation to increased physical activity and accelerate post-workout recovery . During intense exercise much of the pool of ATP consumed in large quantities such as the contractions of the muscle fiber is degraded and excreted from the muscle cells into the bloodstream. Losses are quickly replenished by intracellular adenine nucleotide synthesis. A key substrate in the regeneration of ATP inventory is ribose . It also takes part in the synthesis of nucleic acids, necessary for the synthesis of muscle protein. Used in CARBO PLUS glucuronolactone, a precursor of ribose synthesis, ribose enhances its functionality as well as inhibit its degradation . Furthermore, the compound is involved in the regeneration of glutathione, which is one of the most important antioxidant cellular protection include red blood cells and muscle cells against oxidative stress caused by intense training. Used in the preparation of taurine strongly inhibits catabolism powysiłkowy exercise and maintains a high concentration of calcium in muscle cells, reduces the synthesis of serotonin in the brain and thus ograicza fatigue produced during exercise and has been shown to insulinomimetyczne. CARBO PLUS an additional advantage is the presence of hydroxycitric acid, which inhibits the synthesis of fatty acids from sugar precursors, stimulate the metabolism of fat, while protecting against protein catabolism. Excess carbohydrates supplied CARBO PLUS does not lead to accumulation of fat but notice the muscle protein anabolism and muscle glycogen synthesis. Maltodextrin (glucose polymers and oligomers), Garcinia cambogia in powder (Cambodian Garsynia - HCA source, fruit peel), acidity regulator (citric acid), aromas, sweeteners (acesulfame K, sucralose), dye (yellow orange).